The World Day of Kidney was marked at the Faculty of Medicine of the University of Tetova. In honor of this day, the scientific group of this faculty, under the direction of the coordinator, Doc. Dr. Arbëresha Bexheti Ferati, organized short lectures from eminent names of the field of nephrology. Dean of the Faculty of Medicine, Prof. Dr. Kastriot Haxhirexha evaluated this event as extremely important, adding that thanks to the engagement of the scientific group, today students and professors treat kidney diseases from Albanian nephrologists. He called upon students to be more active during presentations, because through them they can gain new knowledge and advance as in their careers. Deputy Minister of Health in our country, Dr. Asim Musa, said that all health institutions in our country devote special importance to this day, by joining this initiative of the World Health Organization for marking this day, because as he said, it is known that the kidney is a very important organ in the human body and that many diseases, whether acute or chronic for a short time or over the years, are attacking its function. He also appealed to all citizens to take greater care of these diseases in order to prevent these diseases on time. The event was welcomed by the Deputy Speaker of the Doctors Chamber of the Republic of North Macedonia, Dr. Sci. Ylber Besimi and Chairman of the Albanian Doctors Association, Prof. Dr. Nevzat Elezi. 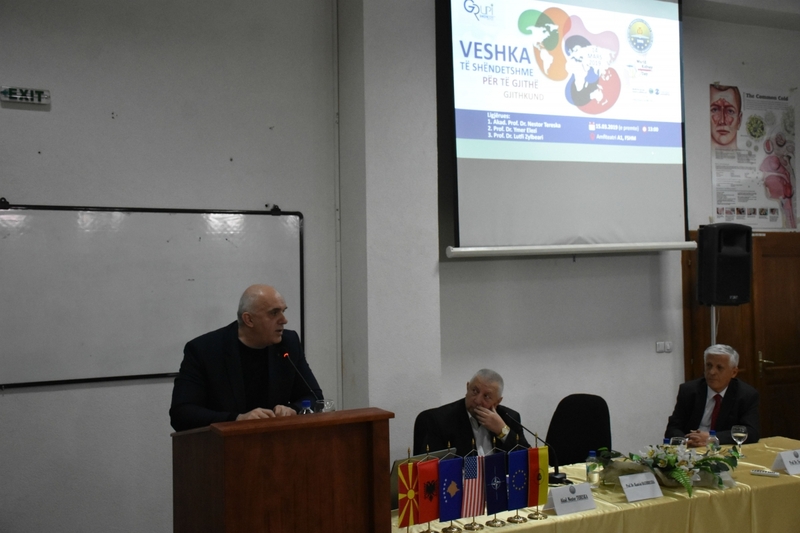 Academician from the Republic of Albania, Prof. Dr. Nestor Tereska presented his lecture dedicated to the history of the development of nephrology, hemodialysis and kidney transplantation. Dr. Ymer Elezi from the Republic of Kosovo, in his presentation, mainly focused on management of renal clinical insufficiency. The lectures were concluded with the presentation of Prof. Dr. Lutfi Zylbehari’s lecture, who spoke on “Rhabdomyolysis and acute renal failure” in front of the participants. At the end of this activity, the Rector of the University of Tetova, Prof. Dr. Vullnet Ameti, in sign of appreciation for their work and the contribution given in the field of medicine, in particular the nephrology, to the former Rector of the University of Tirana, Academic Prof. Dr. Nestor Teresa and Prof. Dr. Ymer Elezi conferred the portrait of the founder and first Rector of the University of Tetova, Prof. Dr. Fadil Sulejmani.